This past summer we spent a lot of money on one player, which was tremendous and encouraging. Five years ago we spent less than £5million on a 17 year old Welshman, but it almost feels like we've spent big on a new player. We signed him and sent him out on loan a couple of times to get some game experience. He came back to Arsenal, hit some really good form and was just beginning to earn his place in the team until he got Shawcrossed. A tackle from an seemingly amateur player that threatened the career of an promising 18 year old. Less than a year later, with huge love from the Arsenal supporters, he steps on to the pitch again to try and start his Arsenal career from scratch. Perhaps I'm being too forgiving, but when a player gets his leg snapped in two and doesn't touch a football for the better part of a year, you'd be right to expect him to take a good while to get back to form. This is where the support faded and expectations took over. The challenges in Aaron Ramseys career were forgotten, and the fans quickly turned on him, even asking for him to be sold due to his less than stellar performances. Just the thought of seeing Ramsey in another shirt other than the famous Red and White makes me shudder, and I'm glad those voices were never truly heard. Ramsey went down, made some changes to his game, simplified his game and came out of his teen years a much better player. Arsene Wenger has given a lot of time and faith to many injury prone players in his years at Arsenal, so the relatively short amount of time he gave Ramsey must be looked back upon as a great investment of time and resources. We started to see the reemergence of Aaron Ramsey's form early last season, when he put in some fantastic performances in the middle of the park, and made himself almost a necessary part of the Arsenal starting eleven. His box to box movement, linking the defense and the attack was something you'd expect to see from a player with many more games under his belt, and he has just continued to improve. This season he's added the attacking, playmaking and goalscoring side of his game to his already impressive resumé. In the 2013/14 season, Ramsey has scored 11 goals and has 6 assists so far. This, a quarter way into the season, compared to the 2 goals he scored in the entirety of last season is astounding. It's a sign that a player is confident, clearly has the ability, but most importantly he is in the right team and enjoying his football at the current time. What more can you ask of a player you spent £4.8million on five years ago? Fans from every team ask for their respective teams to 'spend money' and 'buy big names'. If you told them they already had that potential top quality player in their ranks ready to take the league by storm I think most would be more than happy with that. 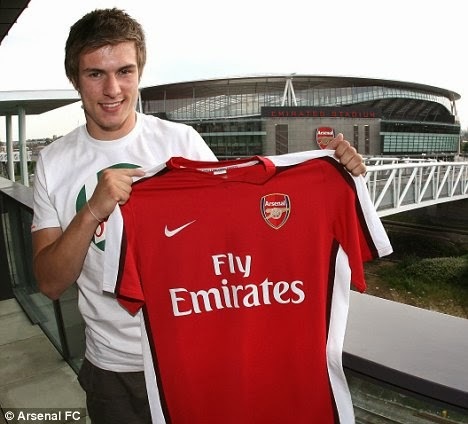 Aaron Ramsey has already invested in Arsenal, just as we invested in him. The young Welshman has already given Arsenal his commitment, desire and clearly his full effort. So instead of spending £30million on a 'big name' player to play in our midfield we've given one of our own the chance to take this team to the next level, and I think he's grasped that chance with both hands and perhaps even wrapped his legs around it too. Just try and take this chance away from Aaron Ramsey. This is his club, he's an Arsenal player and this is his time to fulfill the potential his been labeled with but more importantly repay the faith this club has shown him. May his football forever grace the pitch at The Emirates, and long may he wear the famous Red and White of Arsenal Football Club. Rambo!